The inaugural actions on Monday, May 14 addressed children, women and people with disabilities in poverty. Much of the major media reporting on that day and in the weeks since has neglected to mention the U.S. war economy and militarism let alone the connection to domestic poverty, despite the principles laid out by the Campaign. Montgomery, Alabama – 10 people cited for disorderly conduct at Court Square. Little Rock, Arkansas – 18 arrested after blocking traffic downtown. Hartford, Connecticut – 16 charged with disorderly conduct for blocking Capitol Avenue near the interstate. Indianapolis, Indiana – 14 cited for obstruction of traffic at a downtown intersection and jailed overnight. Des Moines, Iowa – 10 cited for refusing to leave the offices of Gov. Kim Reynolds. Topeka, Kansas – Two dozen people cited for unlawful assembly and unlawful obstruction of a roadway at 9th and Topeka Boulevard. Augusta, Maine – 22 charged with trespassing and failure to disperse/unlawful assembly outside the Governor’s Mansion. Annapolis, Maryland – 11 cited for obstructing free passage and failure to obey a lawful order when they blocked traffic in front of the statehouse. Minneapolis, Minnesota – 13 people arrested. Jefferson City, Missouri – 88 people issued summonses for obstructing a lawful police order to move. Concord, New Hampshire – Six arrested and taken to jail for blocking traffic downtown. Trenton, New Jersey – 19 arrested while blocking traffic outside the statehouse. Raleigh, North Carolina – 49 arrested for blocking traffic around the statehouse. Harrisburg, Pennsylvania – 13 arrested at a sit-in outside the statehouse, cited for disorderly conduct and blocking the roadway. Columbia, South Carolina – 16 charged as pedestrians in the roadway outside the South Carolina statehouse. Montgomery, Alabama – 13 people arrested. Little Rock, AR – 2 people arrested. Sacramento, California – 18 people waiting to see Gov. Jerry Brown were arrested when the State Capitol building closed, and racked up five charges each. Washington, D.C. – 59 people arrested. Topeka, Kansas – 18 arrested for trespass at voter-suppression leader Kansas Secretary of State Kris Kobach’s office. Baton Rouge, Louisiana – Nine arrests blocking downtown traffic. Annapolis, Maryland – Four cited for disrupting work inside the statehouse with songs and chants. Boston, Massachusetts – 16 “orderly” arrestees removed from the statehouse. Lansing, Michigan – 16 arrests during protest at the Grand Tower building in Lansing. Minneapolis, Minnesota – Two waves of blockades shut down the light rail downtown, resulting in 18 arrests for trespass and interfering with transit. Jefferson City, Missouri – Police cited 12 people. Trenton, New Jersey – 12 people arrested. Albany, New York – 27 arrested inside the statehouse at closing, blocking halls and doors. One man jailed overnight for misdemeanor resisting arrest and felony assault allegedly injured a state trooper. Raleigh, North Carolina – 13 people arrested. Harrisburg, Pennsylvania – 24 arrested blocking the halls of the statehouse with banners. Columbia, South Carolina – 18 people arrested for blocking a downtown street. Nashville, Tennessee – 21 arrested for obstruction before they could take over the James Robertson Parkway. Montpelier, Vermont – 14 arrested for refusing to leave when the capitol building closed. Olympia, Washington – 19 people arrested. Sacramento, California – 20 people who disrupted proceedings in the State Assembly cited on three counts. Hartford, Connecticut – Five arrested for disorderly conduct blocking rush-hour traffic. Washington, D.C. – 39 arrested at Sen. Mitch McConnell’s office, cited for “crowding, obstructing, or incommoding” and released. Topeka, Kansas – 12 arrested after they blocked traffic for about an hour. Baton Rouge, Louisiana – Two arrested for disturbing the peace after being removed from legislative appropriations committee meeting. Annapolis, Maryland – 6 people arrested. 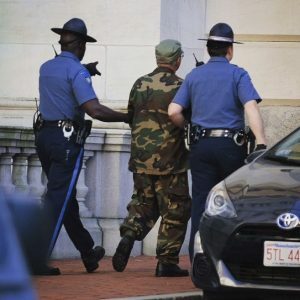 Boston, Massachusetts – 16 arrested after refusing to leave the building. Kalamazoo, Michigan – 19 arrested for trespass after they refused to leave the statehouse. Jefferson City, Missouri – 15 cited on the scene and one was taken to the county jail for citation. Concord, New Hampshire – Eight arrests for refusing to leave the statehouse at closing. Trenton, New Jersey – 7 people arrested. Albany, New York – 28 people arrested. Raleigh, North Carolina – 12 arrests for trespass at a legislative office building. Columbus, Ohio – 4 people arrested. Nashville, Tennessee – 23 people arrested blocking downtown street near venue for Trump speech that night. Montpelier, Vermont – 10 arrested inside the statehouse after it closed. Olympia, Washington – 16 people arrested. To find an event near you, visit poorpeoplescampaign.org. More information can also be found at breachrepairers.org. * This tally is updated from the brief report published in the Nuclear Resister #188 (June 1, 2018), thanks to the detailed reporting of Kyle Moore, who was arrested in Washington D.C. and has since been compiling weekly reports of arrests during the Poor People’s Campaign. Read them all at medium.com/@kylemmoore725. The Nuclear Resister will continue reporting on arrests associated with the Poor People’s Campaign, which clearly incorporates opposition to militarism and war. We invite contact from activists in each of the places where arrests were reported to help subsequent reporting on any prosecutions. If we’ve missed an action that resulted in arrests, let us know. Please leave a message at 520-323-8697 and we’ll return your call ASAP, or email nukeresister@igc.org. Thank you.